New Community Corporation (NCC) in Newark, New Jersey is a Community Development Corporation with an annual budget of $67 million and employs 600 local residents. The CDC manages 2,000 housing units, has roughly $500 million of assets and owns businesses whose proceeds go toward underwriting such social programs as day care and medical support for seniors. In addition, NCC is involved in health care, education, training, childcare and runs a community newspaper, arts programs and a federally insured credit union. Over the course of four decades, New Community has become one of the nation’s largest and most comprehensive providers of community-based programs and services. Today, it stands as the perhaps the most compelling model of “critical scale” community-based development. Founded in 1968 by Msgr. William Linder, then a young parish priest, it was born out of the civil unrest that spread through inner cities like Newark during the late 1960s. NCC's mission is simply put: "To help residents of inner cities improve the quality of their lives to reflect individual God-given dignity and personal achievement." NCC opened its first real estate development project in 1975 and followed up with a series of family and senior residences in the 1980s and 1990s. In 1985, NCC completed the renovation of its current headquarters, St. Joseph Plaza, and ushered in a focus on economic development projects as well. A 180-bed Extended Care Facility opened in 1986 and a transitional housing facility for homeless families, called Harmony House, was completed in 1989. Harmony House can accommodate 102 families. The New Community Neighborhood Shopping Center, including a Pathmark supermarket, opened its doors in 1990 as the first supermarket in the city's Central Ward. The pace and scope of NCC’s undertakings mushroomed during the 1990s to include a rapidly expanding presence in health care, Latino development and immigration services, a Workforce Development Center, and a credit union. Having weathered job losses during the 2008 recession, NCC leadership is now expanding housing and employment and foresees this continuing in the future. 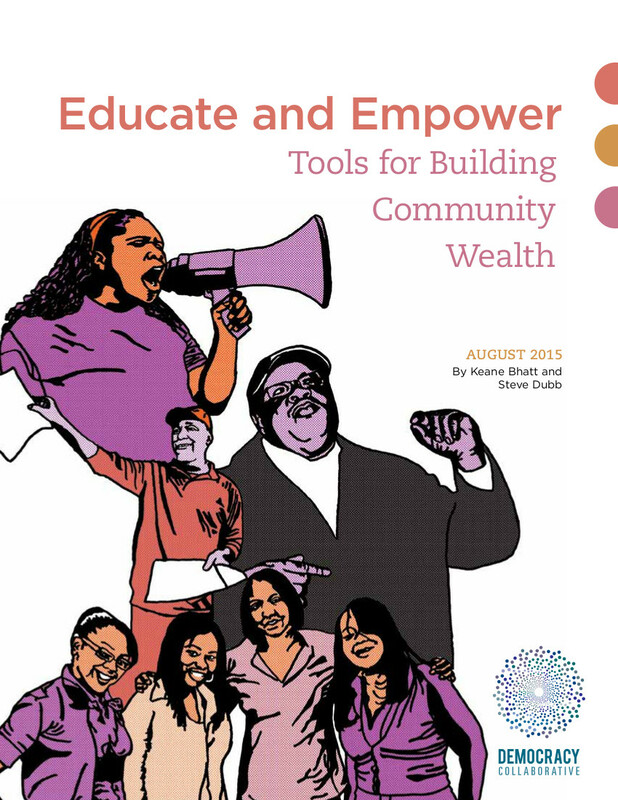 Learn more about the New Community Corporation and other innovative community wealth building initiatives in our report Educate and Empower: Tools for Building Community Wealth. Perseverance is Key to Building Scale: Many community organizations, businesses and development groups start and fail in the seven years that NCC took to create its first housing development. The time frame for community wealth building on the scale of NCC, in a region so affected by disinvestment and deindustrialization, can be extremely long and must be a consideration for the participants of the intiative, funders, and stakeholders. Closed-loop Systems Create a Community Reinforcing Economy: The degree to which NCC has integrated its housing, educational, and economic activities to maximize its multiplier effects is nothing short of astonishing. In virtually every facet, there has been close thought paid to creating a self-reinforcing social reality within the geographic space. For example, New Community Extended Care Facility provides ATMs linked to NCC’s own nonprofit credit union that offers non-predatory financial services. The senior home's cafeteria offers $4 lunches and doubles as a culinary school for on-the-job apprenticing. NCC’s ambulances are serviced by students of its own automotive training center, and many of the nurses who work at the senior center are graduates of NCC's nursing school. The career ladder is welcoming enough so that even a formerly homeless mother who came into NCC's transitional housing is now a licensed practical nurse on the path to a full RN with free tuition; she benefited from free child care as she studied. NCC's thousands of properties are maintained and repaired by an in-house staff who are all paid living wages. "We do our own maintenance, environmental services, plumbing, and security," says executive director Richard Rohrman.